Florida is one of the most diverse, beautiful, and unique states in the U.S. Owning a home here, however, can have its own singular set of issues. This can make finding the right home insurance Florida difficult and frustrating. RTC Insurance Advisors can help you sort through the confusion. Get your free quote today. We offer 37 companies to insure you have the lowest rate with the best company. Once you enter some initial information, we start working for you on the spot. Our process is straight forward. We have state of the art insurance systems to aggregate all our companies from low premium to high. After we see which companies are in the top five for rates, we'll head over to their websites and finalize your home insurance Florida quote. In doing this, we are able to send you accurate rates from companies that are available to insure with. Instant online quotes are never accurate, so it takes us to go in for you and get an actual quote that you can review. After your review, we'll answer your questions, make any adjustments to the quote and complete your application for coverage. We achieve this with one phone call and you'll be insured. It's that easy. So, please answer the questions below and look forward to your quote. It'll be on its way. Thanks. The landscape and topography in Florida are unlike anything else in the world, from the everglade swamps to the Florida keys. It is a popular state for retirement, or just for anyone who loves warm weather and sunshine. Some states focus on agriculture, some on tourism, and others on industry. Florida sets itself apart from other states by having major economic forces functioning in all of them. Florida also is in a unique position topographically. The majority of the state is no more than seven feet above sea level at any one time, and there is no point in Florida more than seventy miles from the ocean. Springs, rivers, and swamps dot the landscape throughout the entire state, and weather can be severe, even devastating, for Florida residents. Sinkholes are common enough that the state requires all home insurance Florida policies to cover possible damage from catastrophic ground collapse. These things can present something of a challenge to homeowners looking for the best insurance at the lowest cost. Understanding the basics of home insurance Florida will go a long way toward helping you find the right policy. There are a few additions that Floridians should be particularly aware of. 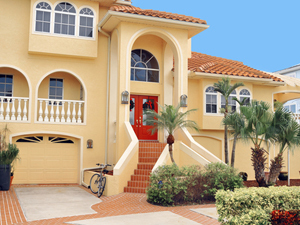 Here are a few things you should know about home insurance Florida. There is an ordinance or law exclusion that you have the option to purchase in your home insurance Florida policy. It is not required, but in the event that a city, county, or state ordinance or law causes the cost of a repair to rise if you do not have this addition to your policy your insurance company will not pay for the increase. Many home insurance Florida policies include damage from wind storms, hurricanes, or even hail, but in high risk areas these may be excluded. The majority of the state of Florida is very close to sea level and hurricanes, wind storms, and hail are very real and common dangers. What this means is that many insurance companies in Florida exclude coverage for these things. You should read any documents carefully and ask questions about the range of your coverage before you purchase. The Hurricane Insurance Affordability and Availability Act created a larger number of deductibles available for homeowners, but there may be exclusions that you should be aware of. Hurricane deductibles apply only to damage incurred during a storm and are separate from normal deductibles. Be aware that you may have to pay additional out of pocket expenses for these types of claims. There are other concerns that are unique to home insurance Florida, but these are a few major issues that anyone purchasing insurance for their property should be aware of. Talk to us if you have any additional questions or concerns.